Halloween snacks don’t have to be filled with horrifyingly unhealthy, sugary treats to be fun. Crispy Fruit high-quality freeze-dried fruits snacks with 40 or less calories per serving are the ideal fun and delicious healthy Halloween treat for kids and adults alike. Delicious, all-natural Crispy Fruit snacks are a fun and frightfully healthy alternative to sugary Halloween treats. Crispy Fruit single serving bags are the perfect healthy treat for trick-or-treaters. 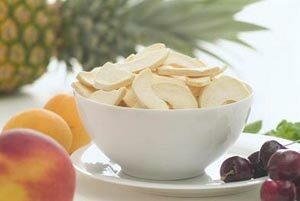 Crispy Fruit is available in 3 flavors: Crispy Apples, Crispy Apricots and Crispy Peaches and can be purchased at supermarkets, natural and whole food stores and other fine food stores.